The series focuses on my talk with local author and historian Thomas Dilley as we walk through the cemetery and talk about its important aspects. I will also get a citizens perspective on the cemetery from Fred Quillin of WMCAT who is a local history buff in the city of Grand Rapids. This is part one of a two-part series talking about the history of Oak Hill Cemetery and the people buried there. In this part, we will discuss the architecture and layout of the cemetery. Most Grand Rapidians have driven past the Oak Hill Cemetery, and many of them are unaware of the historic and architectural treasure it is to the city. Its peaceful fields fills two city blocks in southeast Grand Rapids. The cemetery is bordered by Alexander to the north, Union to the west, Adams to the south, and Eastern to the east. Unlike Fulton Street Cemetery, which is of an old world graveyard design, Oak Hill is a perfect example of a rural garden cemetery. “This type of architecture is a direct reflection of the rejection of the graveyard. This is a place of rest and reflection,” said Thomas Dilley, who regularly gives tours of Grand Rapids' historic cemeteries. In 1853, Oak Hill was started as a small Jewish cemetery in what is now the city's southeast quadrant (Union and Hall). It was at the east boarder of the city, East Street, present-day Eastern. In those days, the surrounding area was sparsely populated with houses that sat far apart. If you go to the present-day location, you will see many headstones of prominent Jewish citizens from Grand Rapids history. One of them, Julius Houseman, was the mayor of Grand Rapids in 1872 and Michigan representative to the U.S. Congress from 1883-1885. His daughter gave six acres of land to the Grand Rapids Board of Education for use as an athletic field in memory of her father. Houseman Field is located in the Midtown neighborhood and continues to be shared by several area high schools. There are stones laid on many of these monuments. This is a Jewish tradition that has its roots in ancient times when grave monuments were mounds of stones. Visitors to the grave would add stones to represent that the monument to the dead was never complete. Now, it is a symbolic gesture of love in memoriam that is as strong as a rock. In 1859, some local investors came together and purchased the land around the Jewish cemetery. One of the investors, Jonathan Allen Giddings, plotted and named the cemetery. It was originally a private cemetery acquired by the city in 1885 and then opened to the public. In the begining, it was composed of two different cemeteries: South of Hall Street was called Valley City Cemetery and north of it was Oak Hill. They merged to become a large city cemetery. The majority of burial plots are from the late nineteenth century, and the presence of wealthier inhabitants is evident in the form of mausoleums and giant markers. These individuals started the large revenue producing organizations in the city, some of which still exist. They are the early philanthropists and leaders that shaped this city and state. Most of these founding families are buried in plots next to one another. “They chose to have their family plots together just like they had lived in the city neighborhoods. They all knew each other’s families and lived close to each other. They chose familiarity in death," Dilley said. During that time, Roman, Greek and Egyptian architectural details were popular, and many of the mausoleums feature them. Dilley does not believe the wealthy were trying to out-do one another. Dilley explained that even though a majority of the wealthy were Christian, they chose styles from pagan cultures because the ruins of those cultures are still visible today. The logic was that the best way to ingrain a family legacy is with a huge monument that will never crumble. “In 1,000 years, our houses may crumble in this city but a majority of these mausoleums will still be here,” Dilley said. Oak Hill has a wonderful blend of Romanesque, Greek, Gothic, and Egyptian Revival architecture. The revival architecture features recognizable charicteristics form these ancient civilizations. In Oak Hill you can see how the architects mixed ideas from these revivalist periods. Many of the arches are of the Gothic and Romanesque styles. One type of monument that is seen throughout the cemetery is the elaborate stone benches. These are known as an Exedra. This style reaches directly back to Greece where benches like this would be in public spaces. People would congregate in these spaces and hear talk to each other. Places like this are where many of the philosophers of Greece would spread their knowledge. 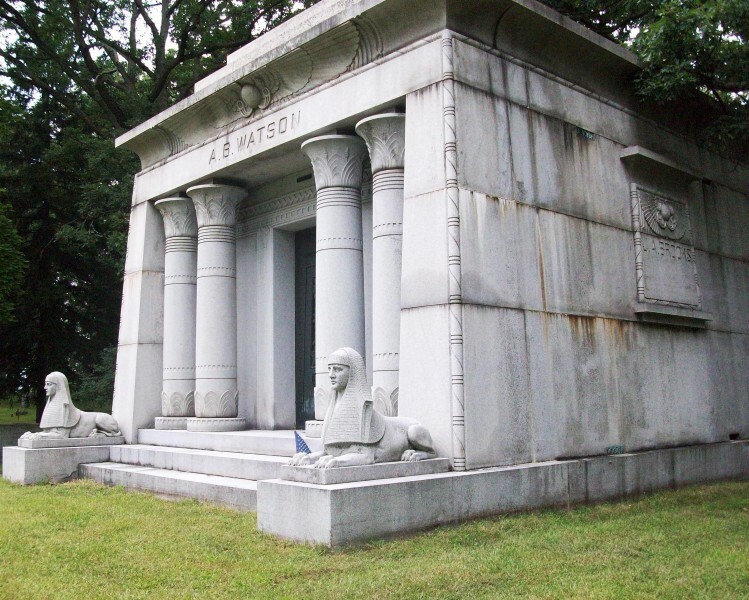 Egyptian Revival is visible in many mausoleums. The most prominent is the largest and most expensive in the center of the cemetery. This is the burial sight of A.B. Watson. He was a major in the Civil War and a prominent lumber baron. He died in his 50s suddenly on the way to the train station. The mausoleum is a recreation of an Egyptian temple called a Mastaba. Temples were smaller in pagan cultures because they were reserved for priests only, not the masses. The sphinxes are the only one of their kind in Michigan. Inside this mausoleum is a marble temple for reflection. The coffins were buried under the floor. The outside is made of granite. The roof is the largest piece of granite in West Michigan. This structure cost around $200,000 at the time it was produced in the early 1900s. It would be worth ten times as much now. When looking at the solid pieces of granite that make up the mausoleums and obelisks, image the effort it took to get the materials here. Most of the granite came from New Hampshire. It had to be brought in by train and then brought to the cemetery by a large wagon pulled by several horses. The two buildings at the cemetery are quite impressive as well. 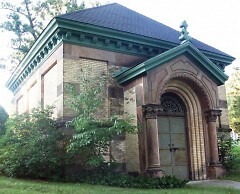 The maintenance building was built in 1905 and is of Hall Street on the north side of the cemetery. The ice house was built in 1901 and is in the Valley City side of the cemetery. At the time of its inception, it was used to hold bodies during the winter. They did not possess the equipment to dig through frozen earth. Across from the ice house is a large plank area of the cemetery. This is the paupers' side. These individuals were impoverished and could not afford burial. The cemetery would bury them in unmarked graves by the hundreds under this plot of grass. The records of who the grave belongs to and where they are located were lost in a fire a long time ago. People are no longer buried in this part of the cemetery for fear of accidental disinterment of another grave. I spoke with Fred Quillin, a Grand Rapidian and city history enthusiast, to get his take on the architecture of the cemeteries. "Every day as I ride my bike through the city, I imagine what the city looked like pre-1900, pre-urbanization, pre-Federal Highway Act, pre-automobile. The trees were big and high. The terrain more hilly and organic. The streets seemed to meander just a little more than they do now. This is what these cemeteries still look like because they were created in these times and have laid still since, virtually unadultered," Quillin said. "In my perception, the city was in many ways more vivacious in those days, more lively. I somehow ironically feel this liveliness in these cemeteries, making them very sacred portions of ground within the city limits." The next article in the series focuses on some of the famous people buried in Oak Hill and describe what they did for this city. First, thank you for your comment. I actually am working on an article right now that deals with a very famous man buried in the Holy Cross Cemetery. His funeral was the largest in Grand Rapids history before Gerald R. Fords in 2006. I have thought about doing something more on Holy Cross but I first want to tackle St. Andrews private cemetery located on Madison. I am in talks at the moment with an Historian for us to do some reasearch on the cemetery. St. Andrews is relativly unknown to most people and the ones that do see it do not understand the importance of the people buried in it. Some of the earliest French-Canadian pioneers in this region are buried at St. Andrew’s Cemetery and many members of the Campau family. are we talking some local boxing history here? Nice work again, Mike, telling some of our city's untold stories. One thing I always wonder about that cemetery (which is quite near to my house, and I go by frequently): Who is responsible for the upkeep of the mausoleums? There's one in particular (a yellowish brick one just south of Hall) that is falling down and is enclosed with orange snow fencing. If you can include anything about that in the next piece I'd be interested to know. Thank You so much for your nice comment. I will not be speaking about any of those issue in my next article; but I am happy to answer both questions here for you now. First, the city of Grand Rapids is responsible for the upkeep of the cemetery and all the things in it. The fact that this monument to history is kept nice for generations to see by using our city tax dollars is impressive. Thats one reason I have encouraged people to visit these places since there paying for them regardless. Second, The yellow brick mausoleum you see is actually one of oldest in the cemetery. Most people who manage cemeteries do not like brick mausoleums because they are prone to crubling after a 100 years or so. There is not much known about the mausoleum due to the story being lost to history. Cemeteries have the right to destroy any structure they feel has lost its structural integrity and is unsafe. They simply will take the bodies out knock it the structure down and then intern them in the ground in the same spot. The city was talking about taking this action with the forementioned mausoleum but the historical preservation commission stepped in and found different craftsman to donate there time to restoring it and funded the project now it is slowly but surley becoming a nice structure again. The very sad thing about Oak Hill is that on many of the mausoleum you see evidence of attempted break ins and where metal has been ripped off most likley sold for scrap. I thoroughly enjoyed your news article! Thanks for taking the time to gather and report on this fascinating city landmark! I personally know Tom Dilley as one of our board members of the Grand Rapids Historical Society and he never ceases to impress people with his wealth of information and his gift of first class presentations. His training as an attorney really shines when he's on stage as he never fails to highly engage and entertain his listeners! Thanks again for a great job with your story. I look forward to Part II of your report! Thank you for your comment, I am trying to get as much historic infromation as I can out to the younger generations in this city in hope that they will have a greater respect for this cities lineage.